Does Congress have the guts to fix feral horse crisis? Home /BLM, Environment, Resources/Does Congress have the guts to fix feral horse crisis? Beyond legislative efforts to impede horse slaughter and unlimited sales as management tools for America’s feral equines, Congress, including members of both parties, has simply lacked the guts to honestly address the burgeoning crisis. Conclusions drawn at the opening session of the Bureau of Land Management’s (BLM) annual Wild Horse and Burro Advisory Board meeting in Salt Lake City, are not unlike preceding years. 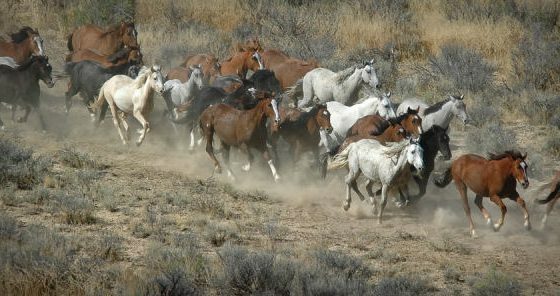 In past years, the BLM has encouraged an “all of the above” management plan to address overpopulation, range destruction, and the skyrocketing costs of keeping feral horses in off-range facilities. •The Secretary shall cause additional excess wild free roaming horses and burros for which an adoption demand by qualified individuals does not exist to be destroyed in the most humane and cost efficient manner possible. However, Congress, under pressure from animal rights groups and horse advocates, have added language in various appropriations riders placing untenable requirements and expenses on those who would transport horses to slaughter, as well making the sale of horse meat for human consumption a crime. Beyond legislative efforts to impede horse slaughter and unlimited sales as management tools for America’s feral equines, Congress, including members of both parties, has simply lacked the guts to honestly address the burgeoning crisis. The Bureau of Land Management, the primary agency charged with managing feral horses, has been more realistic, and its failure to properly manage western feral equines is due in no small part to unending lawsuits brought by radical animal rights and horse advocacy groups, including the Center for Biological Diversity and The Cloud Foundation. Feral horse populations are already unmanageable and continue to mushroom at a 20 percent per-year growth rate. Appropriate Management Levels (AML’s) are topping one-thousand percent of sustainable numbers in some places. 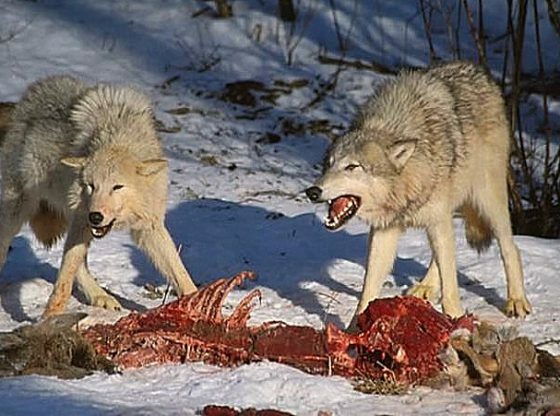 The range, including wildlife habitat and the habitat of endangered species such as the Greater Sage Grouse, is being destroyed in what has been described as a “slow burn.” As populations continue to explode, the animals are compromised, and disease, thirst, starvation, and death ensue. 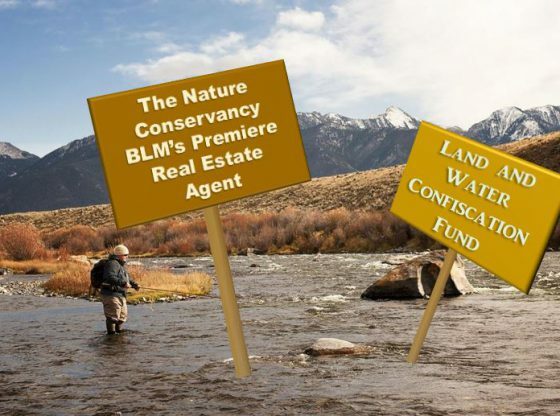 Armed with the hard facts about the worsening crisis, BLM’s advisory boards, composed of a mix of cowboys, horse experts, range scientists and horse advocates, has consistently urged unlimited sales and humane euthanasia. 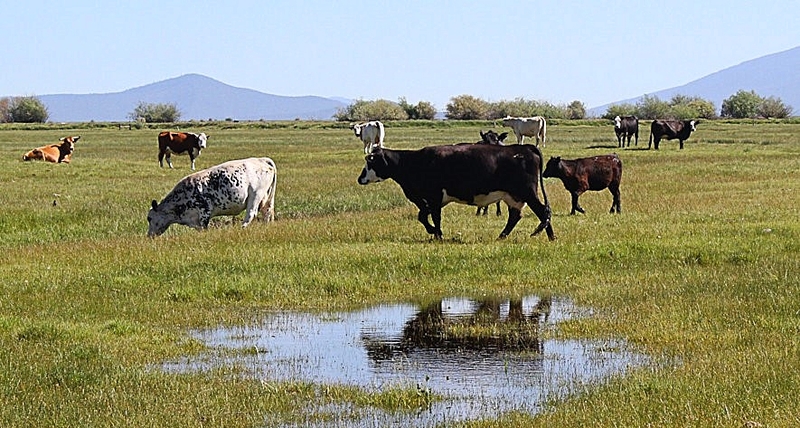 Feral horse and burro overpopulation is the keystone issue in this evolving crisis. With robust reproduction rates of 20 percent per year, aggressive behavior, and appetites that can denude the range in a short period of time, the feral horse crises worsens each year. Because there are so many excess horses, many in poor condition or with infectious diseases, there is neither enough room in off-range facilities nor enough individuals willing to adopt the animals to bring numbers to sustainable levels. BLM costs have run over $50 million per year to maintain horses in off-range facilities and another $30 million on range gathering activities and adoptions. 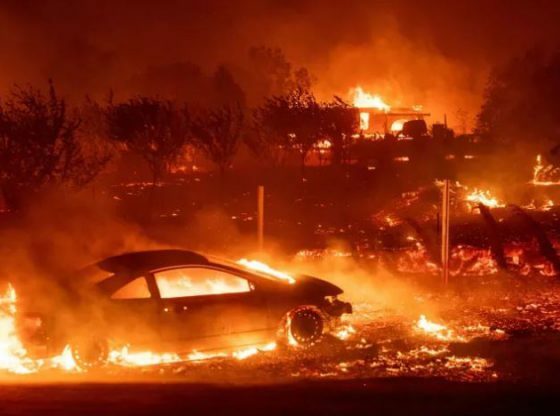 Without effective tools such as fertility control, including spaying and neutering, sale without limitations and humane euthanasia for aging, sick or unadoptable horses, this crisis is fast reaching a breaking point, leaving irreversible destruction of habitat and private property in its wake. Feral horses and burros will repel native wildlife species including large ungulates and birds. Elk, antelope, deer, bighorn sheep, mountain goats, and other large animals are forced to wait until the horses move on before they can access water resources. 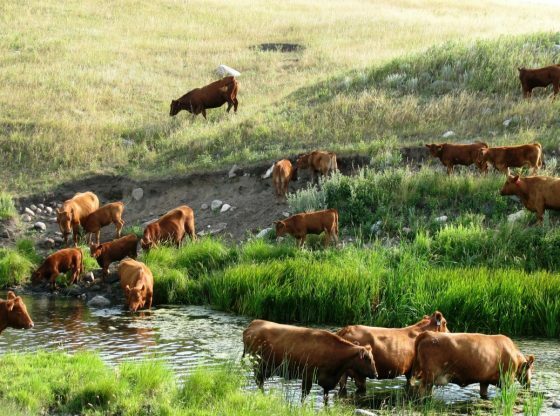 Horses will quickly degrade natural springs and will often destroy man-made stock ponds, tanks, and other sources. Range destruction by horses often lays bare large areas where vegetation disappears and soil is subject to erosion and invasive plant species. Horses in particular are aggressive defenders of water and food resources, and wildlife often suffer and die as a result, or move out of an area completely to avoid the horses. 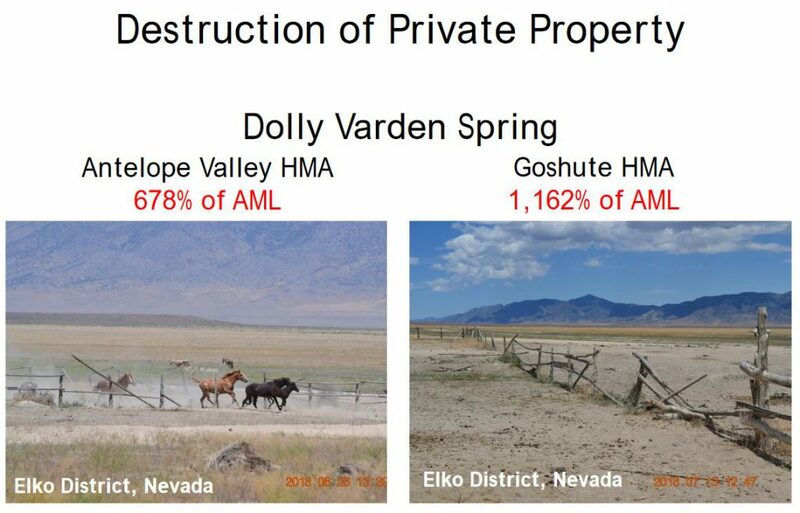 The image above of antelope unable to reach a watering source is from the Pancake Horse Management Area (HMA) where numbers are over 400 percent of AML. 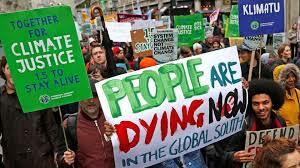 …malnutrition, dehydration, parasitic infections, inbreeding, starvation, poor birth condition, early death. 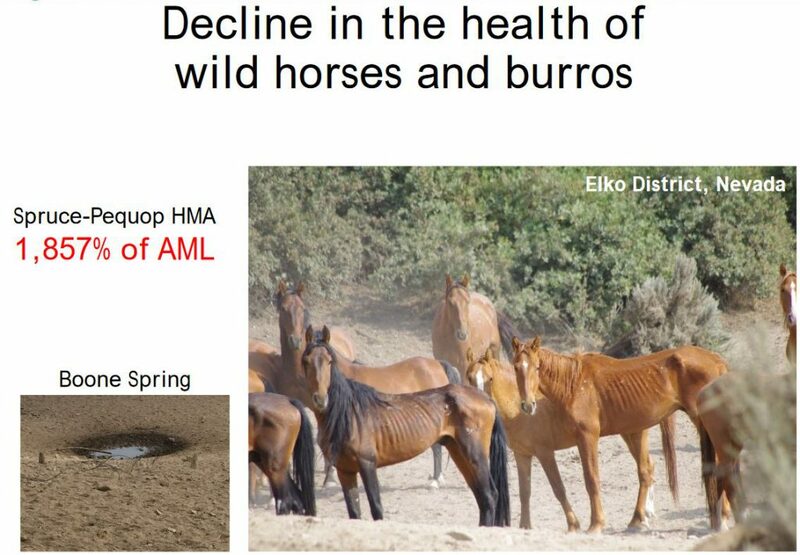 The starving horses shown in the above slide are in the Spruce-Pequop HMA where numbers are approaching 2,000 percent of sustainable levels. Destruction of private property, including private grazing allotments, includes range destruction, fence and structure destruction, crop destruction, and conflicts between feral horses and domestic animals. 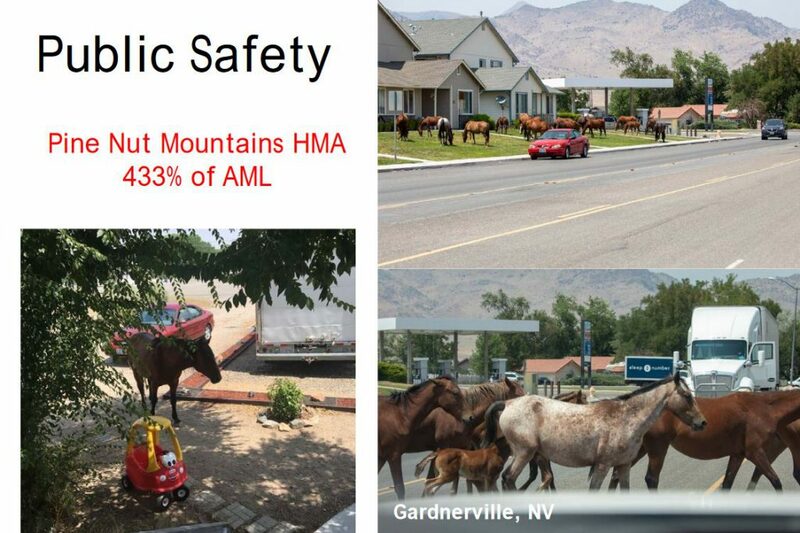 The photos above are from Antelope Valley and Goshute HMA’s where horse numbers are at 7 times and nearly 12 times sustainable levels, respectively. Public safety concerns include invasion of neighborhoods, horses on roadways, spreading of disease such as Infectious Equine Anemia (Horse HIV) from feral populations to domestic horses. Photos above taken from the Pine Nut Mountains HMA where numbers are nearly 5 times sustainable levels. Whether or not Congress will have the guts to tackle this problem and boldly support recommended BLM management proposals has yet to be seen. 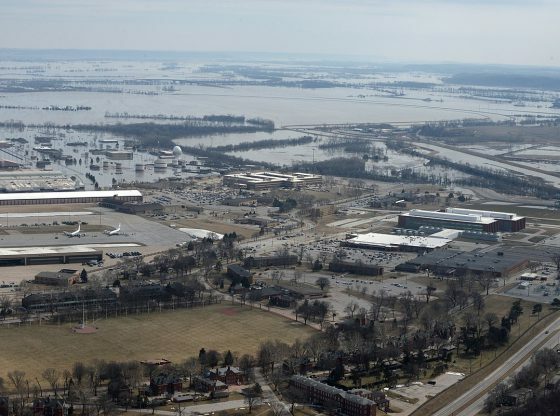 In the meantime, the damage caused by overpopulated feral horses and burros to native species, and the accompanying habitat destruction and suffering will only increase.